Back in the spring Mattel released a set of five “Pop Culture Collection” Hot Wheels with graphics taken from classic Beatles albums. Beatles fans rejoiced at the news, but were disappointed when a nationwide conspiracy of scalpers proceeded to cherry-pick just two of the designs, making it nearly impossible to complete a set. They probably used the “dark web” that you keep hearing about on TV to cook up this scheme. I even wrote about it in The PopCulteer. 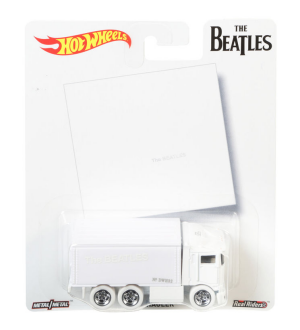 However, Beatles fans can now pick up a complete set, including the two “rare” cars, for about what it would have cost to buy all five in the first place…and you get a really cool presentation box as well. Toys R Us is offering this set as a holiday exclusive. It was supposed to hit stores in late October, but the last time I checked, they had yet to show up in Charleston. However, you can order them online, and I saw them in great quantities when I was out of town last week. 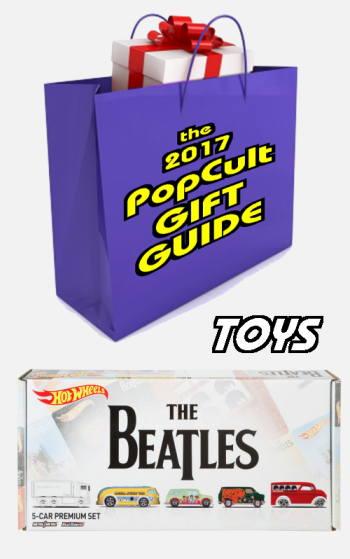 Any Beatles fan will love this special collector’s box of 5 Hot Wheels Pop Culture vehicles. Each fan-favorite vehicle represents a classic album from the Fab Four’s influential career. Each premium collector diecast car has a metal body and metal chassis, Real Rider tires, and deco details inspired by different memorable albums. The five cars are a ’67 Austin Mini Van (Sgt. Pepper), the “Haulin’ Gas” bus (Magical Mystery Tour), a Dairy Delivery van (the US version of A Hard Day’s Night), and the two cars that were nearly impossible to find: A Ford Transit Supervan (Rubber Soul) and the Hiway Hauler (The Beatles “The White Album”). It is a pure delight to see the dreams of scalpers crushed like this. Those last two cars, which sold at retail for around five dollars each, were all over eBay with asking prices ranging from thirty to eighty bucks each. What was really odd was that they chose the car based on “The White Album,” which, as you can see to the left, is the least interesting of the lot. As a whole the cars are really fun representations of the albums they represent. With this set not only do you get really cool Hot Wheels with great Beatles graphics, you also get to stick it to the troll-like Hot Wheels scalpers who make life unpleasant for everybody. The cars in this set are exactly the same as the cars that were sold earlier this year, the only difference is the presentation box that’s included as a bonus. You ought to be able to find this collector’s set at any Toys R Us, or order it online. It’s perfect for any Beatles fan who’s still young at heart.